For the lake of the same name, see Topaz Lake. The CDP is located on the northwest shore of Topaz Lake just north of the California border. 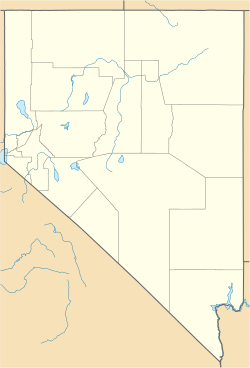 U.S. Route 395 runs through the community, leading north 37 miles (60 km) to Carson City and south 66 miles (106 km) to Mono Lake in California. According to the United States Census Bureau, the Topaz Lake CDP has a total area of 1.7 square miles (4.4 km2), of which 1.2 square miles (3.1 km2) is land and 0.50 square miles (1.3 km2), or 29.87%, is water. ^ a b "Geographic Identifiers: 2010 Demographic Profile Data (G001): Topaz Lake CDP, Nevada". U.S. Census Bureau, American Factfinder. Retrieved January 24, 2013.